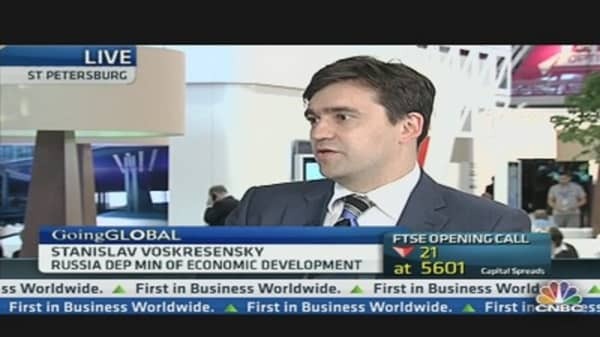 Russia is taking steps to decrease its dependence on oil, with the government mulling a different formula for calculating the oil price for the state budget and measures to encourage other sectors of the economy to grow, Stanislav Voskresensky, Russian deputy minister of economic development, told CNBC.com on Thursday. Russia's oil exports are both a blessing and a curse for the country, analysts told CNBC.com, as the recent fall in oil prices is likely to translate into a higher budget deficit, with half of the revenues to Russia's budget coming from the oil and gas sector. "We are pretty concerned about this. That's why the government is coming up with rules to decrease the dependence on oil," Voskresensky said on the sidelines of the Saint Petersburg International Economic Forum (SPIEF). The price of oil taken into account when the budget will be calculated will be based on historical prices, to ensure a possible fall is taken into account, Voskresensky said. "The budget will be calculated with a lower oil price," he explained, but did not elaborate on how many years will be taken into consideration when averaging the price. Currently, the Russian government makes forecasts for the oil price, on the basis of which it estimates budget revenues. For 2012, it raised its estimate to $115 a barrel from a previous $100 a barrel during the spring, when oil prices were higher. The price for the forecast is that of Urals crude, which is currently trading $1 below Brent crude. Brent crude fell from $124.7 a barrel in mid-March to around $91 currently. Last year, the surging oil prices helped Russia to post a budget surplus but World Bank experts predicted that this year the country will record a deficit because of a big increase in spending on social policy and extra-budgetary funds. "We try to encourage other industries, such as shipbuilding or the aircraft industry to grow" to contribute more to revenues to the budget, Voskresensky added.